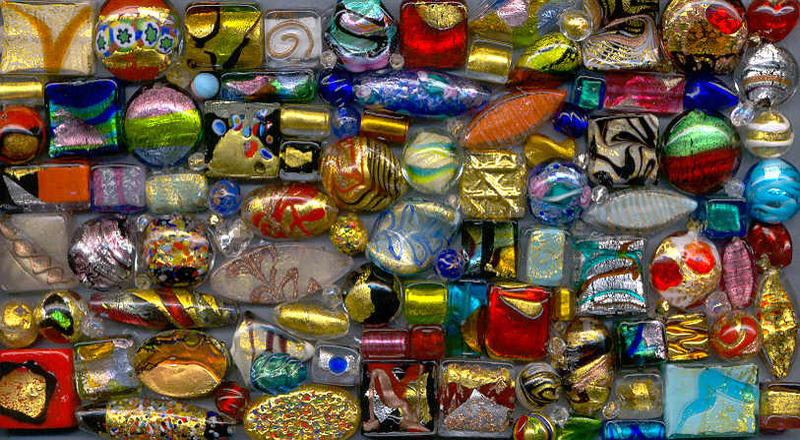 Murano Glass, Venetian Beads, Loose Beads. $50.00 Minimum, on Total Purchase of Wholesale Loose Beads; Not Including Shipping and Insurance. These prices are very low for genuine Murano Glass, handmade Venetian beads; in fact, they are wholesale prices, or in most cases, below wholesale. We do not sell "1" of each bead, or samples; buy 2 or more of each bead. Because these are handmade, lampworked beads, made one-by-one under the flame; melting the Murano Glass onto a copper wire; applying various colors of Murano glass, different designs, different shapes, and various gold, or silver foils, or aventurina (copper filings), there may be variations in the hand applied designs. Also, since these are hand made beads, not machine made, the beads may occasionally, have some rough edges at the ends; a natural effect of the handiwork, and is not a defect. Please note: no returns on loose beads. Click on sub-categories below, to see our beautiful Venetian beads! Please note that we may show a group of beads in the photo, for you to see the selection much better, but the price noted is for one bead.